Discounts available based on length of stay. The condo has ceramic tile flooring throughout and walk-in porcelain tiled showers in both bathrooms, with the kitchen counter and master bath vanity tops tiled as well. Kitchen appliances include flat-top electric stove with oven, full-size fridge with ice maker, over-the-counter microwave, toaster, coffee maker, blender, brand new large capacity washer/dryer. All the ceiling areas have been filled with insulation and faced with 2-ply bamboo. Our condo is located at Sandpiper Village I. The Sandpiper grounds boast beautiful mature landscaping and a recently renovated pool complex with a large tile-bottomed pool plus a good size jacuzzi and two Webber gas grills. My condo is less than a minute walk to the pool complex and about a 3 to 20 minute drive to more than a dozen beaches on the norht shore. 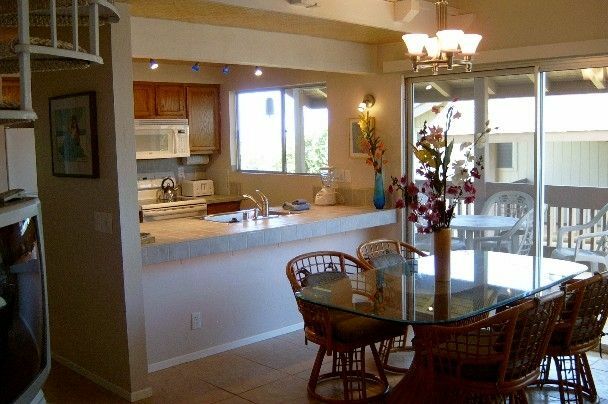 Located at the Sandpiper Village I condo complex, within the beautiful community of the Princeville Resort. This 2nd floor condo affords you full advantage of the constant sea borne trade winds and the ocean views from the 2 bedroom lanai, the master bedroom and the loft. High vaulted ceilings add to the sense of openness and space. There are Webber gas barbecue grills available for guests to use on a complimentary basis at the large pool complex, located less than a minute's walk from the unit. Hot meals prepared in this manner can either be enjoyed at the pool or taken back to the condo. The Princeville Resort is located on Kauai's North Shore where you are just minutes away from exploring her many wondrous attractions such as pristine, secluded beaches, the best Kauai has to offer. Great snorkeling, windsurfing, board surfing, or swimming are just minutes away as well. A hike on the Kalalau Trail along the Na Pali Coast reveals unparalleled vistas of ocean, mountains, waterfalls, and sheer cliffs that will stay with you forever. And for the golf enthusiast, Princeville is the home of two world class golf courses, the Maikai Course and the Prince Course ranked #1 in Hawaii by Golf Magazine. Both courses offer discounts to guests of Princeville Resort. Amenities - Phone, Cable TV (with 3 TVs), 2 DVD players, 2 pair wireless headphones for quiet TV watching, VCR, Stereo w/tape and CD player, full kitchen w/ flat top stove and microwave hood, Full Size Refrigerator w/ ice maker, Dishwasher, Coffee Maker, Toaster, Blender, Cooking Utensils, Washer/Dryer, Hair Dryer, 3 Ceiling Fans, Dishes, Flatware, Glasses, Linens/Towels, Soap, Shampoo/Conditioner, Body Wash, Ceramic Tiled floors, showers and Lanai, Insulated Vaulted Ceiling Faced with Bamboo, Full Length Mirrored Closet Doors, etc. Sandpiper Village is centrally located within the Princeville Resort among other condo units and single family homes. There is on-site parking with a reserved parking space at no additional cost and you're no more than minutes away from dozens of different beaches, hiking trails, and wondrous vistas. You are less than a mile away from The Princeville Shopping Center anchored by Foodland, a full size super market. Kauai is an island of unequaled beauty and discovery. No matter how often you return, and you will return, you will continue to uncover her hidden secrets of secluded beaches, multi-level waterfalls, and soul pleasing vistas. Our Puamana town home is located within The Princeville Resort on Kauai's north shore. It is lush and green and has to be one of the most beautiful place on this planet. If you are a first-time visitor, you will soon discover that you had not chosen Kauai, Kauai had chosen you! All floors of the condo are ceramic tile. All baths have large porcelain tiled showers, with the kitchen counter and master bath vanity tops tiled as well. All the ceiling areas have been filled with insulation and faced with 2-ply bamboo sheeting. We provide everything you would need to make your stay enjoyable and memorable: shampoo/ conditioner, soap, linens, towels, plus beach/pool towels, cable TV, telephone and high speed broadband, high end cookware, utensils and appliances. The list goes on. The Princeville Resort is located on Kauai's North Shore where you are just minutes away from exploring her many wondrous attractions such as pristine, secluded beaches, the best Kauai has to offer. Great snorkeling, windsurfing, board surfing, or swimming are just minutes away as well. A hike on the Kalalau Trail along the Na Pali Coast reveals unparalleled vistas of ocean, mountains, waterfalls, and sheer cliffs that will stay with you forever. And for the golf enthusiast, Princeville is the home of two world class golf courses, the Makai Course and the Prince Course ranked #1 in Hawaii by Golf Magazine. Very accommodating, nice folks. Mahalo! Nice condo for cheap, close to lots of great restaurants! The property is fine and clean, could use some reconditioning and updates as it's getting a little worn. A new $250 memory foam mattress from Amazon would go a long way! Otherwise nice and quiet property and close to good food spots. We had a wonderful stay. The condo was perfect. Fully stocked with everything you need including the beach chairs!!! Princeville is a nice area filled with friendly people. We had the good fortune to meet Karl and had a great visit. We would stay at Sandpiper 234 again in a heartbeat. This place was great and had everything we needed! Thank you so much Karl and Rachel for sharing your condo with us! We had 4 adults and 2 children, everyone was comfortable. I was happy o find a play pen for our little title one to sleep in. We hope to be back soon! Close to everywhere we like to go in Kauai. Supplied all the beach necessities, big bonus. Would definitely stay again. Very nice condo, super clean, well equipped. Nice pool and whirlpool. Close to Princeville and Hanalei. Five stars! Aloha Marc-Andre, and thank you for your great review. I'm glad you enjoyed your stay at our condo and hope you'll consider us again the next time your travel plans include Kauai.